This book is a statement of the current law of compulsory purchase of land and compensation for that purchase. It covers all major aspects of the procedure for the compulsory acquisition of land and deals in full detail with all aspects of the law of compensation for such an acquisition. 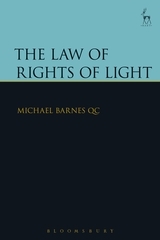 The many and diverse statutory provisions are organised into a series of chapters containing all principles and rules and there is a full analysis and explanation of the leading authorities on the subject and the principles derived from those authorities without which the subject cannot be understood. The aim of the book is, not only to explain the statutory provisions and to organise the various possible claims for compensation into different heads, but also to explain and analyse the substantial body of case law which has built up, particularly in recent years, and the relationship between that body of law and the underlying statutory provisions. The book also attempts to explain the purpose of the statutory provisions and the reason for the rules that are derived from the authorities. 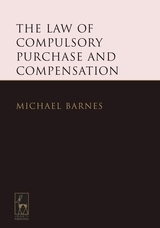 Chapters of the book are devoted to the procedure for formulating and pursuing a claim for compensation and to the valuation principles which must be applied in advancing claims. An Appendix is provided by Mr Nicholas Eden FRICS, a leading valuer in the field, which contains examples of different types of compensation valuation with annotations as to how the valuations are prepared and built up. 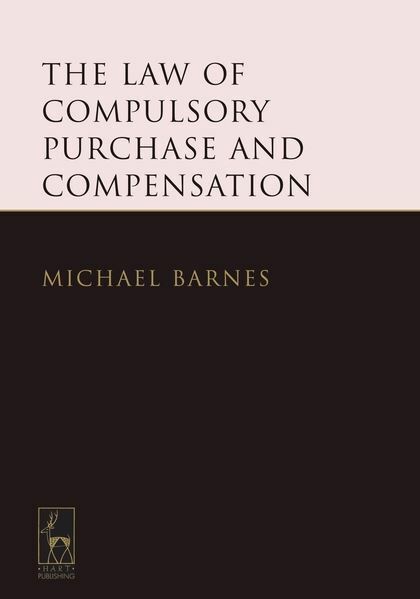 A further aim of the book is to provide, where possible, practical advice to public authorities and landowners involved in the process of compulsory purchase and compensation as well as to explain the legal principles.